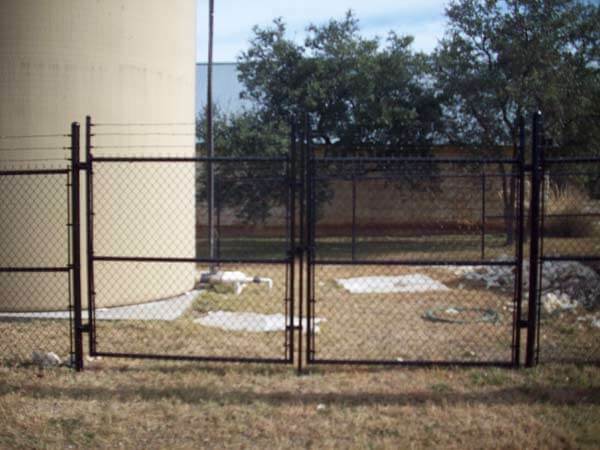 If you’re looking for both an economical and durable fence or gate for your commercial location, to provide security and ensure protection of your property, you definitely want Apple Fence Company’s expertise. We are committed not only to providing the industry standard commercial security chain link fences, with strength and durability, but also to matching the right fence to the right location. We specialize in providing the strongest, most economical fence to commercial clients—the galvanized security chain link fence. These are the fences that you are accustomed to seeing at most commercial locations—silver, strong, and long-lasting. But did you know that you have many customizable options for your security fence? If silver doesn’t work for you, you can customize your fence from a variety of components: colored fence fabric, colored fittings, colored rails and posts, and a choice of gate option that will allow you to create the exterior look you want. One of the ways that we can customize your galvanized chain link security fence is through the finish. You can choose a powder or PVC (vinyl) finish, which comes in black, dark brown, and dark green. You can also combine that choice of finish with another option, like vinyl chain link fabric, to create a customized effect—and don’t forget the fitting and gate hardware! Mix and match the options to create a one-of-a-kind commercial security fence that not only performs beautifully but also looks the part. If metal and the expense of iron is not in your company’s budget or design plan, you might consider the budget-friendly option of a security chain link fence coated in vinyl. These options are often appealing to locations interested in both budget-friendly materials and durability, like schools and small businesses. The vinyl chain link fence option also offers the choice of black or green for the finish color.